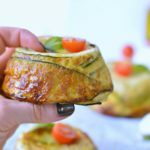 If you love easy clean eating recipes for breakfast you will be amazed by this Crustless Zucchini Quiche with Pesto and Parmesan. OMG! Pesto + Parmesan + Zucchini + egg is a killer combo ! 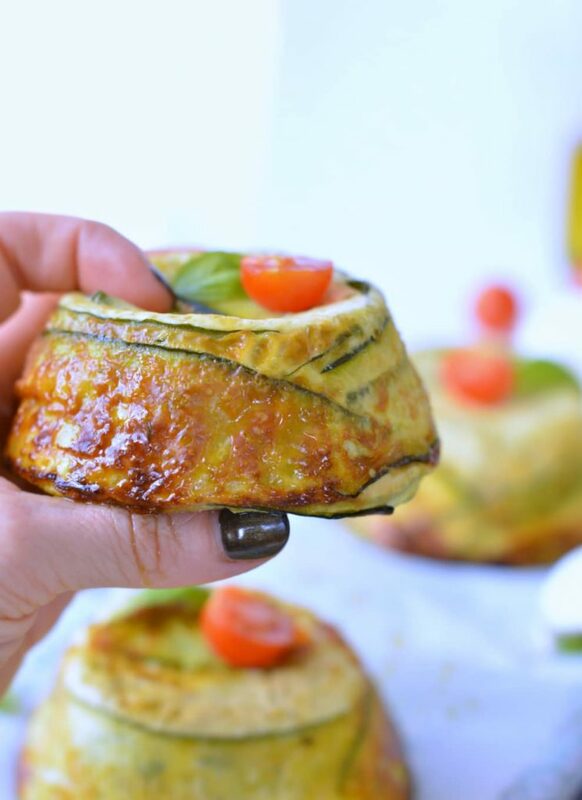 I always loved zucchini quiche but this Crustless Zucchini Quiche taste absolutely amazing plus it is an easy muffin tins recipe meaning those are super easy to eat on-the-go for those busy breakfast! I know it is not the zucchini season in New Zealand and I should not buy zucchini right now. But, what can I do? Baby is craving zucchini and cheese! Good excuse don’t you think? I am now almost 15 weeks pregnant – I like to think about the week ahead and not the one I am currently going through. It makes the pregnancy process a bit ‘faster’ in my mind – yes you know I don’t really enjoy being pregnant because I am a foodlover and it makes me feel sick! I guess that is why I allow myself to buy zucchini at $9/kilo right now – crazy I know! but I have to eat what goes down. SO back to this lovely recipe! As I said I have always been a big fan of crustless quiche and zucchini quiche especially. But I also always found crustless zucchini quiche soft and difficult to carry as an on-the-go breakfast. So today I tried to make them in a muffin tray using some thin zucchini ribbon to design a crust-like style that makes them hold together a bit more. You see pretty easy to hold in your hands 🙂 but it even look pretty lovely served on a plate for dinner. I made 12 of those zucchini quiche so we had plenty to eat for dinner too. I usually rewarm zucchini quiche in the microwave for few minutes and eat them lukewarm. But I tried those cold and it was delicious too. It remind me a savory french flan – which is a soft egg and cheese dish that we serve in France as an entree. I really believe it makes a great cold summer dinner too serve with a green salad. I love the rich zucchini filling. It thick and dense but still very juicy and soft with a delicious pesto and parmesan flavor. Really, there is no more to say than Bon appetit or simply enjoy this delicious healthy low carb recipe and if you try it let me know how you like it hot or cold ? 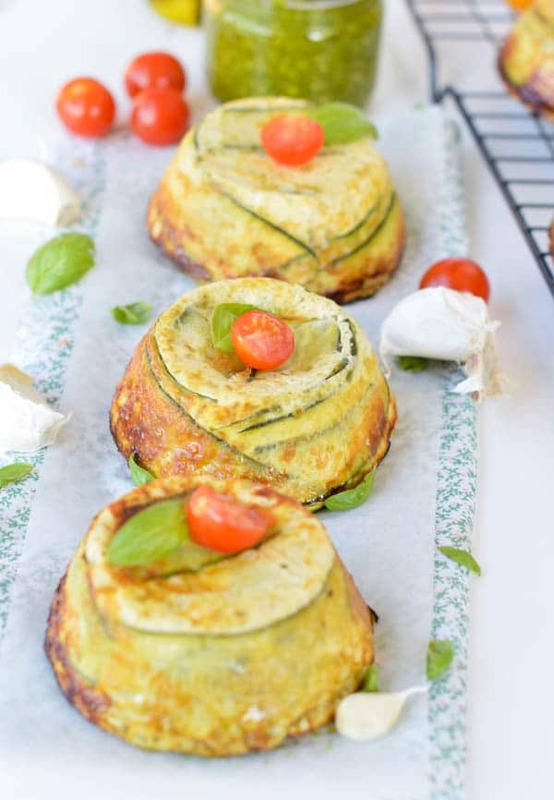 Are you still not sure how easy it is to make this lovely Crustless Zucchini Quiche ? Watch my full recipe video and make this healthy dinner tonight ! Single Serve CRUSTLESS ZUCCHINI QUICHE with Pesto and Parmesan. Low carb, 8.5g of net carbs per serve, fullfilling with 18.5g protein per serve. An healthy brunch recipe for the eggs lover. Clean eating quiche. Paleo + low carb. Muffin tin eggs recipe. With a vegetable peeler, peel one zucchini into thin ribbon. Make sure you trimmed the ends of the zucchini first. Don't peel the zucchini. 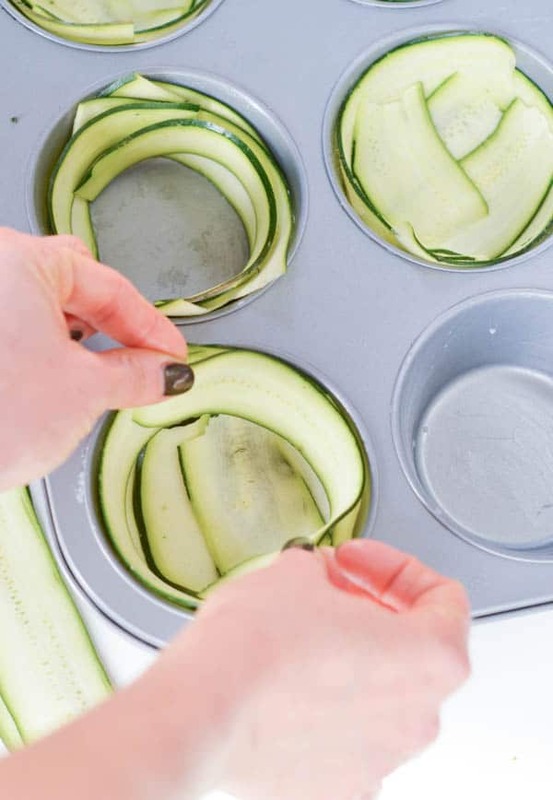 Grease a 8 holes muffin tray with a bit of coconut oil and arrange the thin zucchini ribbons all around the muffin tin including the bottom to create a crust like style. Repeat for each muffin hole until the tray is full. Set aside. Grate fresh zucchinis into 3 cups of grated zucchini. I used a manual grater but you can use a food processor with the right attachment. Squeeze out the excess water with your hand and discard the zucchini water or reuse in another recipe. In a saucepan warm olive oil and add chopped brown onion and grated zucchini. Fry under medium heat until fragrant and no more liquid appears in the pan. It should not take more than 5 minutes. Stir in 2 tablespoon of pesto into the cooked zucchini. Cool down for 15 minutes in a bowl before using. Meanwhile, in a large mixing bowl, whisk the eggs, milk, oregano, pesto and grated Parmesan. Adjust salt and pepper to your taste. 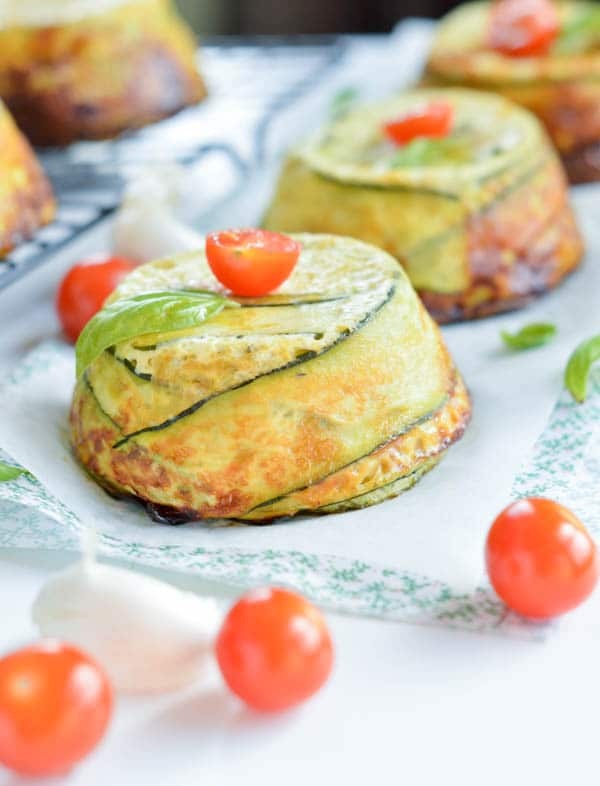 Combine the cooked pesto zucchini mixture into the egg mixture and use the mixture to fill each prepared muffin tin. I used about a cup per muffin case. It depends of the size of muffin tins you use of course mine are jumbo size. Bake for 35-45 minutes or until a pick inserted in the middle comes out clean. Carefully remove from the muffin tray. Place a cookie rack on top of the muffin tray and flip over. All the crustless quiche will comes out together and it should not break using this technique. Store in the fridge up to 3 days, on a plate covered with foil to prevent the quiche to dry out. Freezing: You can freeze the cooked Crustless zucchini quiche too. Wait until cool and freeze in airtight plastic box leaving half thumb space between each quiche. Don't overlap them or separate with a piece of parchment paper - easier to defrost later on. Defrost the day before you intend to eat and rewarm in the oven or microwave few minutes. Cheese: you can also replace parmesan by grated cheeddar, edam or mozzarella. This recipe serve 8 crustless zucchini quiche. Nutrition panel is for one serve/one crustless quiche. Are you able to grow zucchini where you are? I’m a terrible gardener–the only thing I have ever been able to grow is zucchini. It grows despite my terrible gardening skills. Just a thought from an old lady. I am a terrible gardener too. I tried cherry tomatoes, capsicum and lemon and I never get anything great. I should try zucchini for my next attempt if you say it is easy to grow 🙂 It is so expensive in NZ during winter but still one of my fav veggie! Amazing! I also tried them with feta cheese and they were excellent! Do you have the nutrition facts for these? Great! thanks for sharing your positive experience with this recipe. I just updated the recipe with the nutrition facts 🙂 Enjoy the blog. xoxo Carine. Do you know how many regular size quiches I could make with a full recipe of the filling? Thank you. I would say it makes one 10 inches (26cm) quiche. I am not too sure as I always make mine in my muffin tins for on the go breakfast. Enjoy the recipes on the blog! XOXO Carine.